As we age, our nutritional needs change. But it’s never too late to clean up your diet and improve your health. In fact, if you eat right and exercise regularly, you can be healthier at 65 than you were at 45, says Christine Rosenbloom, Ph.D., R.D.N., F.A.N.D., nutrition professor emeritus at Georgia State University and lead author of the Academy of Nutrition and Dietetics’ new book, Food & Fitness After 50. HealthCentral.com asked Dr. Rosenbloom for some common-sense tips for healthy eating after 50. HealthCentral (HC): What are key food choices for people over 50? Christine: As we get older, we need fewer calories to maintain our weight. We have less room in our diet for nachos and margaritas, and we need to choose nutrient-rich foods. These are foods that pack a lot of vitamins, minerals, fiber, and protein into a smaller-calorie package — like an orange versus orange candy. HC: Is there one type of diet that is best for people over 50? The Mediterranean diet, which emphasizes produce, whole grains, fish, and olive oil and nuts for recommended fats. The Dietary Approaches to Stop Hypertension (DASH) diet, which centers around fruits, vegetables, whole grains, low-fat dairy, lean meat, poultry, fish, beans, and vegetable oils and nuts. The Flexitarian food plan, which is more plant-based, consists of fruits, vegetables, whole grains, tofu, lentils, peas, nuts, seeds, beans, and vegetable and olive oils. You can also have seafood, poultry, and meat occasionally. HC: What are some of the big food-related issues for people over 50? Christine: Weight creep is the biggest issue. Many people don’t monitor their weight over the years and don’t think it’s a big deal to gain a few pounds a year. But over time, that can add up to a large weight gain. To avoid weight creep, it’s important to weigh yourself every day or every other day, and track what you’re eating and how much you’re exercising. And it’s interesting, but research has started to show that people don’t gain as much weight as was once thought over the holidays. The problem is that they don’t lose the weight they do gain in January. That’s weight creep. HC: Are there any foods that you particularly like for people over 50? Christine: Yes, protein is the hot nutrient today, particularly for older adults who need extra protein to build back muscle that we start losing at around age 40. For the best results, we now know that you should eat protein at every meal and not just backload your diet with it at dinner. Eggs and dairy products such as Icelandic or Greek yogurt have more protein than other yogurts, and are good choices for breakfast. For lunch, you could have a turkey rollup with vegetables, and for dinner, chicken or fish such as salmon or albacore tuna. If you prefer a plant-based diet, you can get protein from beans, nuts, quinoa, and soy products. It you like nut milks, such as almond or cashew, be aware they are low in protein. However, some brands are starting to be fortified with protein (although you have to check the nutrition label for that). There’s been a change in how we view fats, too. You want to eliminate trans fats from your diet (found in packaged bakery items, frozen pizza, and other heavily processed foods), but we know that not all other fats are bad. For instance, emerging research shows that not all saturated fats are equal: Dairy products such as cheese and yogurt won’t increase your risk of heart disease the way bacon, ribs, and highly marbled meats like prime rib will. Good fats include nuts, olive oil, and avocados. Be careful to limit your portion sizes with fats, though, because they have more than twice the calories of protein and carbohydrate foods. HC: The foods you want to limit are sugar and processed foods, right? Christine: Yes, sugar is the new fat — but we’re talking about added and refined sugars that are found in cookies and cakes. Naturally occurring sugars in fruit are okay. 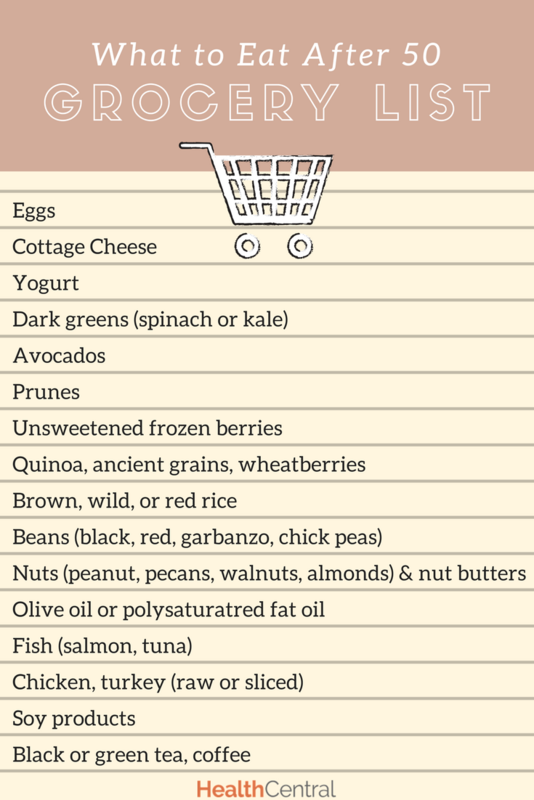 Rather than saying you can’t eat processed foods — since, when you think about it, most foods like canned black beans, yogurt, and baby carrots are processed in some way — I tell people to eat less of foods that contain added sugars, sodium, and saturated fats. Choose whole grains more often over refined grains, but it is okay to eat some enriched grains, like pasta, rice, and bread. HC: Here’s the big question: What shouldn’t you eat after 50? Christine: I don’t think you have to eliminate any foods. You can enjoy a steak or a burger on occasion, or have a piece of cake or a cookie. Just eat them in moderation.